Rachel Emma Silverman has penned a fascinating article for The Wall Street Journal in which she describes what it was like to go to work using a telecommuting robot. She embarked on the project to see how feasible it would be to work and collaborate in this way, and to see if it would make her feel closer to far-away co-workers. 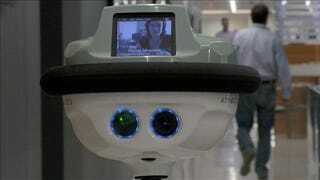 Her experiment revealed that telecommuting robots do have a future at the workplace, just not quite yet. For now, it'll have to come at the price of extreme awkwardness. For the experiment, Silverman's physical presence was assumed by QB-82, a telecommuting robot developed by Anybots Inc. — a company that's trying to get employees and employers comfortable with the seemingly futuristic idea. And as Silverman noted in her article, telecommunication technologies are quickly turning into big business; sales of telepresence and videoconferencing systems reached $3 billion worldwide last year — an astounding 34% increase from the just the year before. As a remote worker based for years in Austin, Texas, the idea of being two places at once sounded intriguing. I communicate with my New York-based editors and co-workers via email, phone and occasional Skype chats, but maybe "botting" could be better. Over several weeks this summer, for a few hours a day, I used the QB to bot into the Wall Street Journal's newsroom from my home office. Rolling around on a Segway-like wheeled base, with a video screen and camera embedded in my "head," I could see and hear my co-workers, who likewise had a portal into my home office life, complete with cameos from my kids and occasional barks from my dog, Bosco. During my robot days, I interacted with co-workers I'd never met before, as well as others I hadn't talked with in years; each of them was compelled to greet me as I cruised down the hall. I chitchatted at the office coffee bar, a more lively scene than sipping coffee alone in my kitchen. But I also nearly careened into glass walls, got stuck in an elevator, could barely hear the discussions in story meetings and got little other writing or interview work done while botting into the newsroom. Technical glitches delayed our progress-we cycled through two robots before a third worked reliably, and it required hours of in-house tech support from Willie Bennett, an indefatigable member of our IT staff whose Job-like patience was tested here. (To their credit, Anybots went above and beyond to troubleshoot, even flying a technician to our New York offices from California to investigate an issue.) Bill Murvihill, a business development executive at Anybots, says customers can send faulty robots back for repairs, but given the Journal's deadlines, the company opted to send a technician. Wherever I went, I needed a constant handler and guide, and the spotty wireless signal often left me stranded-the video window on my laptop in Texas frozen as the Robot Rachel in New York went dead. When a co-worker attempted to roll me into an area with better connectivity, the robot would thrash around, emitting an alarming, guttural noise that startled all in its vicinity. Clearly, we're not at the point yet where telecommuting robots are practical — but that's not to suggest that they're not the future of remote working. As Cisco research has revealed, employees are more honest and open with a human-operated robot than with a human colleague (which is fascinating in-and-of-itself) — so there's clearly something to be said for this approach. And as Silverman concludes, "...to me at least, person-to-robot can't replace person-to-person — yet." You can read her entire article at The Wall Street Journal — and be sure to check out the embedded video which features a touching TNG Data-like moment when poor QB-82 has to be rebooted.